There’s always a big flurry of new cookbooks published in time for the Christmas pressie market. You may already have one or two but if perchance you still have a couple of spare gift tokens hanging around, swing by your local bookshop they may have some special after Christmas offers. Here are a few of my favourite 2015 titles. Several exciting new voices are emerging on the food scene. Anna Jones first book A Modern Way to Eat published in 2014, really piqued my curiosity. The sequel A Modern Way to Cook is one of my stand out books of the year. Olia Hercules, another hot new talent, who brings us a taste of little known East European food . In her new book Mamushka, she casts a spotlight on the food of her native Ukraine and neighbouring countries whetting our appetites with her evocative prose, charming reminisces and super delicious recipes. She completed a diploma in Leith’s in London, did a spell in Italy and an inspirational stint with Yotam and Sami at Ottlenghi in London. Then it was home to record her mum and grandma’s recipes……she followed them round the kitchen with a scales and measuring spoons in an effort to accurately record their pinches, handfuls and glugs of this and that. I loved this fascinating and enchanting book. Sabrina Ghayour, a self-taught chef is yet another beauty. Her debut cookbook Persiana has become an instant classic. She was named by the Observer Food magazine as one of the Rising Stars of 2014 and the Evening Standard named her as one of the 1,000 most influential people in London. 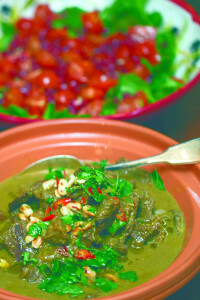 Sabrina focuses on Persian and Middle Eastern Cooking. Page after page of tempting, fresh tasting recipes that made me want to dash into the kitchen and roll up my sleeves. If you haven’t already discovered Sabrina, she’s another one to watch and her book Persiana is definitely worth parting with one of your precious gift tokens for. I love anything Nigel Slater writes and his latest A Year of Good Eating Kitchen Diaries iii doesn’t disappoint. I also loved Sally Clarke’s 30 Ingredients. She’s a beautiful cook – recipes for the sort of food we really enjoy. Alice Waters’ new book, My Pantry which she wrote with her daughter Fanny Singer is a sweet collection of essays and recipes. A charming little book where they share the simple building blocks that they use to create comforting impromptu meals all year round. According to Tom Tivnan – features editor of trade magazine The Bookseller, the biggest trend so far this year are so called ‘clean eating cookbooks’. Cookbook sales are up this year by 10% plus. An astonishing 13,000 cookbooks were published world of which 1,800 were aimed at the so called ‘healthy eating brigade’. 8/10 books sold in 2015 was aimed at this market. Ella Woodward’s Deliciously Ella has been the runaway success of the year. On the Irish publishing scene, there have been several ‘stand out’ books this year. Rachel Allen’s new book Coast to accompany her coastal cooking series has tremendous appeal as has the long awaited Cooking at the Ballymore Inn by Georgina O Sullivan. Simple and delicious recipes loved by devotees of Barry and Georgina’s Inn in Ballymore Eustace in Co Kildare. The K Club Cookbook from producer to plate is an elaborate production, a handsome hard back which would make a super present for a keen ambitious cook. Donal Skehan’s star continues to rise. His newest book Fresh has also been warmly received. Last but not least, a book closely connected to rural life, the Irish Country Women’s Association Book of Home and Family, has been a tremendous success. If you haven’t already got a copy, seek it out for its selection of time honoured favourites. Make this a day or two ahead and the flavours will settle and improve, and it can be kept in the fridge. The tamarind adds a slightly sweet-sour flavour to curries. It’s sold two ways, in blocks of pulp which needs to be mixed with warm water and strained to remove the hard black seeds, or in jars as a concentrated paste. Start with the onions: in a large pan heat a tablespoon of the oil and brown the onions really well. If they are browning too quickly, add a splash of water and continue cooking (you don’t need more oil). When the onions are browned, transfer to a large deep casserole. Sauté the beef in the same pan with the remaining oil. Don’t overcrowd the pan. Transfer the beef as it browns to the onions in the casserole dish. Next blend the spice paste: place all the ingredients in a processor and whiz for a minute. Remove and add to the beef and onions. Then, in a small pan, roast the coriander and cumin seeds, grind in a coffee/spice grinder and add to the casserole with the turmeric, peanuts, coconut milk, tomatoes and seasoning, cover and cook gently for 1 hour 30 minutes or until the beef is tender. Taste for seasoning: you want a good balance of flavours – hot, sour, sweet and salty – garnish with chopped fresh coriander, extra red chilli and peanuts. To serve: this curry goes well with basmati rice or flatbread and it goes especially well with fresh green chutney (see overleaf for recipe). To make the chutney place the yogurt in a bowl. Put the herbs, chillies and salt in the processor with 1 tablespoon of the yogurt. Whiz to a paste, then stir the mixture through the remaining yogurt in the bowl and taste for seasoning. When cooking this dish, the size of pan is hugely important: if it’s too large, the cooking liquid will evaporate and you’ll have very little sauce at the end of cooking time. If it’s too small, then the flavours won’t have room to mingle. Ideally, the pan should hold all the ingredients comfortably. Over time it is good to build up a variety of different sized pans; sauté pans with lids that are flameproof are the most useful. Start by cutting the chicken into 8 pieces. If you have the time, use the wing tips and backbone to make some stock. Set the oven to Gas 4/180˚C/350°F. 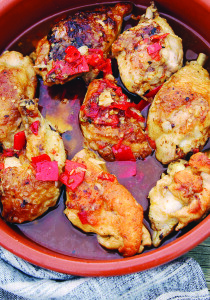 Heat a pan with a tablespoon of the oil, add the chillies and garlic and cook gently for a few minutes, set aside. Grind the cumin seeds in a spice grinder or mortar and pestle, then take half the cumin and add to the flour in a bowl with the seasoning and mix well. Add the chilli and garlic mixture to the remaining cumin in the mortar and pestle and mix to a paste. Next coat the chicken pieces in the cumin-seasoned flour, heat the remaining oil in a large pan and brown the chicken on all sides. Add the spice paste and stock, mix well, cover the pan and cook in the oven for 40 minutes, until fully cooked: digital probe 75˚C. 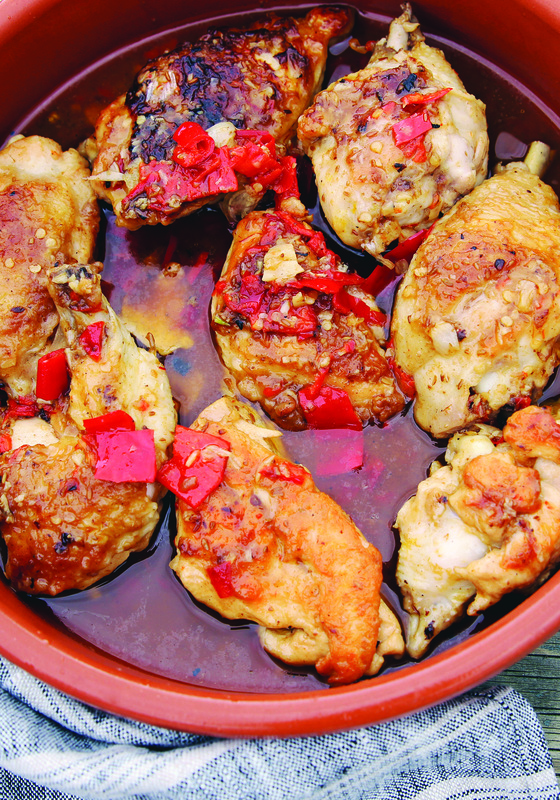 Check the seasoning and serve the chicken with rice, alongside a bowl of mixed salad leaves. Although this is a rustic dish, and should therefore look a little ‘homely’ when presented, it is advisable to take care when slicing the vegetables, so that the individual ingredients look uniform in shape and size. Wash the pumpkin or squash and cut into large wedges. Remove the tough outer skin and the hard seeds. Cut into pieces the size of a walnut. In a small pan gently heat all the spices together for a few minutes or until they are fragrant. Do not allow them to burn. Remove the husks of the cardamom and add the seeds to the remaining spices. Crush them together in a pestle and mortar or grind in a spice grinder. Heat the oil and spices together in a large, heavy-based pan with the garlic and chilli, over a medium heat, stirring continuously to avoid burning. When the oil starts to become aromatic (approximately 1 –2 min – utes), add the pumpkin, onion, celery and fennel, stir well, coating everything in the infused oil. Add salt and cook together for a few minutes until the vegetables begin to soften. Add the stock and the chopped coriander stalks and cover with a lid. Simmer for up to 20 minutes or until the vegetables have become tender throughout. Meanwhile blanch the tomatoes for a few seconds in a pan of boiling water. Remove to a bowl of iced water, then peel. Roughly chop the tomatoes and add to the stew with the chickpeas and continue to simmer for a further 5-10 minutes. Taste for seasoning and add the parsley and coriander leaves before serving alongside steamed rice, crushed potatoes, baked polenta or just by itself as a robust soup. To make the sorbet. Bring the water, sugar and vanilla pod to the boil and simmer for 5–10 minutes or until some of the vanilla seeds have been released. When cool, scrape a few more seeds into the syrup, rinse the pod and keep for another use. Add the clementine juice to the syrup and then the Campari. Stir well and pour into an ice cream machine and churn following the manufactuer’s instructions. Just before it is firm, scoop into a freezer container and freeze for up to 1 week, although this sorbet will be best served within a few hours. Serve with a warm madeleine on the side. Clementines are not as easy as oranges to zest – as they are softer and smaller – it is tricky to get any ‘purchase’ on the fruit whilst grating the rind. The important part is not to collect any pith as you grate, so slowly and gently does it. Lightly whisk the eggs and sugar with the clementine zest until very frothy. Using the whisk, fold in the sieved flour and then the cooled butter. Leave to rest for up to 30 minutes, covered in a cool place. Turn to this recipe in late summer when your garden goes into overdrive or when there is a deal on the ugly but delicious vegetables at the farmers’ market. It’s a simple technique that can be used for almost any vegetable, resulting in a glut of pickles to enjoy well into the winter months. Put all of the vegetables in an 11.5 litre non-reactive container. In a separate non-reactive container, dissolve the salt in the water to make a brine. Transfer about 480 ml (18 fl oz/2 cups) of the brine to a blender; add the garlic, shallots and chillies; process on high speed, pour the puree into the remaining salt brine and stir to mix well. Add the dill bunches to the vegetables, then pour the brine over them. Top the vegetables with a weight to keep them submerged in the brine. Seal the container, using a lid with an airlock, if you have one. If you have sealed it without an airlock, open the container every few days or so to release carbon dioxide build up and check for mould. Place in a clean, well-protected low light area with an ambient temperature 16-20C/60-68F until the pickles taste sour, about 1 month. Refrigerate for up to a year. To serve – slice the pickles into bit size pieces and return them to the brine. Refrigerate until serving, for up to one year. We like to garnish these pickles with torn garden herbs and fennel oil. Last week I was asked a seemingly simple question by a food writer – ‘which do you love most – Christmas dinner or the leftovers’, well now, doesn’t that set you thinking….. Even when you are super organised, Christmas dinner is still quite a mission, but whipping up some recycled leftovers is a more chilled affair entirely. I love the improvisation and creative challenge of incorporating dollops of this and that into something entirely different. Think Asian, Moroccan, Middle Eastern and Mexican as well as traditional favourites. So let’s think what you might have left over apart from the usual morsels of turkey, ham or goose, maybe plum pudding, stale bread, cranberries, sprouts…. Several of these, eg cranberries can be frozen for another time and the sauce itself (see last week’s recipe) is good for months. Mincemeat has a long shelf life, a year at least and can gradually be used when the fancy takes you. It makes delicious Eccles cakes and Pear, Frangipane and Mincemeat tart, all very morish when served warm. Add a teaspoon of mincemeat to a basic muffin recipe and serve them warm with left over brandy or rum butter, no need to apolgise for that, in fact there could well be a ‘scrap’ to get the last morsel. Fresh or frozen cranberries can also be added to muffins or a cranberry loaf popped into ice cubes with a fresh mint leaf to enhance Christmas lemonades and sodas. They are also super delicious added to pear compote. Apple and cranberry chutney goes deliciously with pork or some cold duck or goose. Left over bread of all kinds can of course be frozen, made into breadcrumbs for gratins or pannagratto or as a basis for a bread and butter pudding. We’ve also got delicious recipes for mincemeat and for a Cranberry and Raisin bread and butter pudding. Brussel Sprouts keep well in a cold larder or a fridge but basically they are best when they are really fresh. Do try them roasted or shredded into salads or quickly blanched and dressed as a last minute addition to risotto or a pilaff rice with lots of grated Parmesan or Coolea cheese and maybe a few crisp cubes of chorizo or Merquez sausage scattered over the top. Watch out for RTE’s Christmas cookery programmes. My brother Rory O’ Connell and I have just shot two programmes, first of which will be shown on Tuesday December 22nd 2015. This recipe is a combination of two forgotten skills: poaching eggs and making Hollandaise sauce (which also involves eggs). It is the perfect breakfast for a lazy weekend. First, make the Hollandaise sauce and keep it warm. Poach the eggs. Meanwhile, toast the bread, muffins or bagels. Slather a little butter on the hot bread and lay a slice of ham or freshly cooked crispy bacon on the base. Prop a beautifully poached egg on top and coat generously with the Hollandaise sauce. A classic Hollandaise is based on a reduction of dry white wine, vinegar and finely chopped shallots. In the version we make at the Cookery School we simply emulsify rich butter with egg yolks by whisking and then sharpen with a little lemon juice. Unless you have a heavy-based saucepan, don’t attempt this recipe without a bain-marie. Even on the lowest heat, cooking a Hollandaise sauce in a pot that isn’t heavy-based may scramble the eggs. Once the sauce is made, it must be kept warm, though the temperature should not go above 80ºC (180ºF), or the sauce will curdle. A thermos flask can provide a simple solution on a small scale; otherwise put the sauce into a Delft or plastic bowl in a saucepan of hot, but not simmering, water. Hollandaise sauce cannot be reheated very successfully so it’s best to make just the quantity you need. If, however you have a little left over, use it to enrich other sauces or mashed potatoes. When it solidifies, it makes a delicious Hollandaise butter to melt over fish. We love this light broth with lots of tasty accompaniment to add in at the table. Put the turkey or chicken stock into a wide saucepan, bring to the boil. Taste and season, it should have a full rich flavour otherwise the soup with be bland and insipid. Meanwhile cut each tortilla into 8 ‘chips’. Heat oil in a deep-fry to 180C. Cook a few at a time until crisp, drain on kitchen paper. Add the shredded turkey or chicken to the hot broth – I sometimes use scraps from the carcass from the stockpot but it could be raw or cooked, either brown or white meat. Cooked meat just needs to be reheated in the broth. Raw white meat will take a few minutes to cook and brown meat a little longer. Poach it gently so it doesn’t toughen. Taste again and correct the seasoning. Ladle into soup bowls. Provide each guest with a side plate with some diced avocado, tomato, red onions, sliced green chilli, coriander leaves, tortilla chips and a segment of fresh lime to add to their soup as they choose. Although a risotto can be made in 20 minutes it entails 20 minutes pretty constant stirring which makes it feel rather laboursome. A pilaff on the other hand looks after itself once the initial cooking is underway. The pilaff is versatile – serve it as a staple or add whatever tasty bits you have to hand. Beware however of using pilaff as a dustbin, all additions should be carefully seasoned and balanced. Here we add turkey and ham. Melt the butter in a casserole, add the finely chopped onion and sweat for 2-3 minutes. Add the rice and toss for a minute or two, just long enough for the grains to change colour. Season with salt and freshly ground pepper, add the turkey or chicken stock, cover and bring to the boil. Reduce the heat to a minimum and then simmer on top of the stove or in the oven 160C/325F/regulo 3 for 10 minutes approx. By then the rice should be just cooked and all the water absorbed. Just before serving stir in the turkey, ham and fresh herbs. Bubble for a couple of minutes and pour into a large serving dish and serve hot with a good salad of winter leaves. One of the few mixed salad combinations that works really well. The tart combination of apple and celery makes it an excellent counterbalance to rich meats such as duck or pork, and a perfect foil for leftover turkey, or it may be served as a first course on its own. Separate the celery, wash it and chop or julienne the stalks into 1 1/2 inch (4cm) lengths. Put them into a bowl of iced water for 15-30 minutes. Wash and core the apples, and cut into 1/2 inch (1cm) dice. Make a dressing by mixing the freshly squeezed lemon juice, castor sugar and 1 tablespoon (1 American tablespoon + 1 teaspoon) of mayonnaise. Toss the diced apple in the dressing and let it stand while you prepare the remainder of the ingredients. Chop the walnuts roughly. Add the celery and the walnuts to the diced apple with the turkey and the rest of the mayonnaise, and mix thoroughly. Taste and correct seasoning. Garnish with sprigs of watercress and scatter some chopped parsley and the remainder of the chopped walnuts over the centre. Add 4ozs (110g) sliced dried figs to the above recipe with the walnuts. A croque-monsieur is the quintessential Parisian sandwich. It’s really no more than a grilled ham sandwich topped with grated cheese, but it appears in many different guises. Sometimes a croque-monsieur is topped with a thick Mornay sauce, or transformed into a croque-madame with the addition of an egg. Butter the slices of bread on one side. Place the slice of ham on one buttered side and cover with the other slice of bread. Pop the sandwich under the grill and grill on one side until golden. Remove, turn and cover the uncooked side with the grated cheese. Return to the grill and cook until the cheese is bubbling and golden. Eat immediately while hot – Bon appetit! This light, simple and refreshing salad has a wonderful Autumn freshness. Slice the apples and Brussels sprouts very thinly on a mandolin or by hand and place in a wide bowl. Add the hazelnuts and dress very gently with olive oil and lemon juice and season to taste with salt and freshly ground pepper. Cut the radicchio leaves into strips or pull into bite sized pieces and divide between 4 plates or a large flat serving dish. Spread the apple, sprout and hazelnut mixture over the radicchio in a single layer. Peel, thin slices off the cheese using a vegetable peeler or cheese slicer and lay over the salad. Drizzle 1 teaspoon of apple syrup over each salad and finish with a pinch of sea salt and serve as soon as possible. I’m loving pear cous cous – looks like little bobbles and can be used as a pilaff or as an accompaniment to a meal. Heat 2 tablespoons (2 1/2 American tablespoons) of the extra virgin olive oil in a saucepan, add the couscous and stir for 3 or 4 minutes until coated and toasted. Add the seasoned stock, bring to the boil, reduce to a simmer and continue to cook for about 10 minutes or until most of the liquid has been absorbed and the coucous is al dente. Drain, toss in the remaining 2 tablespoons (2 1/2 American tablespoons) olive oil and allow to cool. When cold, add the dried cranberries, toasted pine nuts and chopped and sliced onions. Add the turkey meat. Grate on the lemon zest over the top, squeeze on some freshly squeezed lemon juice. Add the coriander leaves, toss, taste and pile into a bowl and serve. Bring the sugar and water to the boil with the strips of lemon peel in a non-reactive saucepan. Meanwhile, peel the pears thinly, cut in half and core carefully with a melon baller or teaspoon, keeping a good shape. Put the pear halves into the syrup, cut side uppermost, add the lemon juice, cover with a paper lid and the lid of the saucepan. Bring to the boil and simmer until the pears are just soft – the tip of a knife or skewer should go through without resistance. Add the cranberries, cook for 3-4 minutes or until they just burst. Turn into a serving bowl, chill and serve, on their own or with homemade vanilla ice-cream and fresh mint leaves if available. This is another dual-purpose jam that can be used as a sweet or savoury accompaniment. Delicious on scones or with curd cheese, cold turkey, ham, pork or venison. Peel, core and chop the apples. Put the chopped apple into a wide, stainless-steel saucepan and add the cranberries and 300ml (1⁄2 pint) of water. Bring slowly to the boil and continue to cook over a medium heat until the apples and cranberries dissolve into a pulp. Add the warmed sugar and stir to dissolve. Increase the heat and cook until it reaches a set. Bottle in sterilised jars and cover while still hot. Store in a cool, dry place. Cream the butter, add the icing sugar, beat well. Put all the ingredients except milk and mincemeat into a food processor, whizz until smooth 1-2 minutes. Scrape down the sides of the bowl, then add milk and whizz again for a couple of seconds. Fold in 3 tablespoons of mincemeat. Divide evenly between the bun cases, put 1 tablespoon of mixture in each case. Alternatively, put a half tablespoon of the cake mixture into each case, put about a half teaspoon of mincemeat on top and cover with another half tablespoon of the mixture. Bake for 20-25 minutes approx. Allow to cool on a wire rack. Pipe a rosette or blob of brandy butter cream on top and decorate with Christmas fancies. It seems like most of our readers are total traditionalist because the requests have come flooding in for recipes for a time honoured Christmas dinner. Well here we are. As well as the traditional roast turkey bolstered up with lots of our best loved fresh herb stuffing and all the trimmings, I’ve included a goose with our favourite potato stuffing, lots of gravy and tons of roast potatoes cooked in the goose fat – you’ll need to do twice the amount as they are so crunchy and irresistible. Slow cooked red cabbage will complement the goose deliciously but so too would a dish of cauliflower cheese or creamed celery – a bit 70s but so delicious. Don’t forget to make a bowl of Bramley apple sauce – all of these vegetables, sauces, herb stuffings can be made ahead to lighten the pressure and work load on Christmas day. 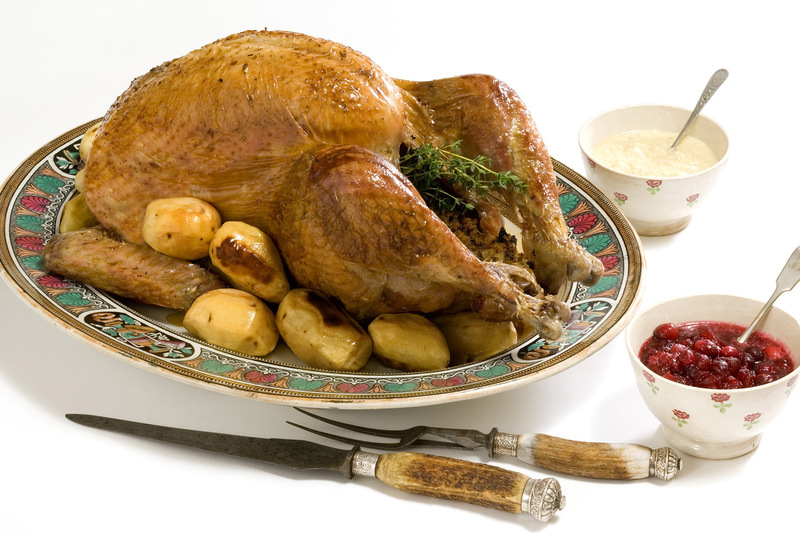 Brining the turkey also makes a phenomenal difference to the flavour, (see recipe). Many families have a favourite starter. We love native Irish oysters as a starter on Christmas day. But I can well understand that they don’t tick everyone’s box. So how about another timeless favourite, Grape, Melon and Mint. It’s light and refreshing and loved by everyone from toddlers to aged great aunts. A green salad is essential after a rich meal. It has the magic potential to make you feel less full so you have room for pudding. Make it with organic leaves for extra deliciousness and a few foraged greens, a subject for lively conversation. There’s lots of navelwort or pennywort, wintercress, wood sorrel and watercress in season at present, these little gems are available in the urban areas as well as the countryside. Christmas Desserts are easy, hopefully you have already make a juicy plum pudding, but if you haven’t managed to get to it, it’s still not too late to whip it up. Alternatively, there are still some available – Peter Ward of Country Choice in Nenagh, Co Tipperary, make some of the best one I know and people are also talking about Clare Nash’s puddings…..
We also love to have a trifle, this too actually benefits from being made ahead but wait until Christmas morning to add the final embellishment of cream, cherries, angelica, hundreds and thousands, silver and gold baubles. A citrus fruit salad would also be an inspired idea, if not for Christmas day certainly on St Stephen’s Day or Boxing Day when despite you’re good intentions you’re probably be feeling a touch bloated. Either way, have lots of clementines, mandarins, satsumas and walnuts in stock for nibbling. Leftovers are my absolute favourite, so hopefully there will be some tasty morsels to provide, an opportunity to make some delicious dishes. Don’t forget a make a turkey stock with the carcass and giblets, it makes the very best broth and basis for warming soups, sauces and stews. We love this turkey broth with orzo, pea and spring onion. There a ton of ways to use up morsels of turkey, ham and goose, that’s if there’s anything left in the carcass after the family have tucked into turkey sandwiches on Christmas evening. Boxing Day pie is a winner but the mixture can be also be piled into popovers or pastry cases to make yummy bites. The revised edition of A Simply Delicious Christmas, published by Gill and Macmillan to celebrate it’s 25th anniversary is choc a bloc with traditional and alternative recipes. Watch out for RTE’s Christmas cookery programme s. My brother Rory O’ Connell and I have just shot two programmes, first of will be shown on Tuesday December 22nd 2015. Friday Night at The Granary Foodstore in Midleton 4th, 11th and 18th December 2015. Casual and family friendly evening menu, the perfect venue for a relaxed bite to eat after the Christmas shopping. The Granary also has a tempting array of Christmas cakes, Chocolate Biscuit Christmas Pudding, gluten free Christmas cakes and mince pies, hampers……. Brining the turkey ahead is so worthwhile. It adds immeasurably to the flavour, wrapping it in muslin means you don’t need to baste it during cooking. We are finding a turkey that has previously been brind is taking a little less time to cook. Frist brine the turkey overnight, not essential but it makes for moist, tender and flavourful eat. Note: It should be soft and juicy, add a little warm water if it has accidently over cooked. To make the gravy: Spoon off the surplus fat from the roasting tin (save for sauteeing or roasting potatoes – it keeps for months in a fridge). Add about 1 pint (600ml/2 1/2 cups) of the strained giblet stock to the roasting tin and bring to the boil. Using a small whisk, scrape the tin well to dissolve the meaty deposits which are full of flavour. Taste for seasoning and thicken with a little roux if you like a thickened gravy. If the gravy is weak, boil it for a few minutes to concentrate the flavour; if it’s too strong, add a little water or stock. Strain and serve in a hot gravy boat. Peel, quarter and core the apples, cut pieces in two and put in a stainless steel or cast iron saucepan with the sugar, water and rose geranium leaves. Cover and put over a low heat. As soon as the apple has broken down, stir and taste for sweetness. Serve warm with the duck, goose or roast pork. This broth can be the basis of a flavoursome light soup to use up delicious morsels of cooked poultry. Bring the stock to the boil; add the orzo, celery and chilli flakes. Cook for approximately 10 minutes or until the pasta is just cooked, add the peas and shredded turkey. Season with salt and freshly ground black pepper. Cook for 3 or 4 minutes, correct the seasoning. Ladle into soup bowls, sprinkle with lots of spring onion and fresh coriander and/or mint. Try to keep some left-over turkey and ham for this delicious pie – it’s the most scrumptious way to use up left-overs and can be topped with fluffy mashed potatoes or a puff pastry lid. 2 x 1.1 L/2 pint) capacity pie dishes with a lip. Cut the turkey and ham into 1 inch (2.5 cm) approx. pieces and shred the crispy skin. Melt the butter in a heavy saucepan, add the chopped onions and ginger if using, cover and sweat for about 10 minutes until they are soft but not coloured. Meanwhile wash and slice the mushrooms. When the onions are soft, stir in the garlic and remove to a plate. Increase the heat and cook the sliced mushrooms, a few at a time. Season with salt and freshly-ground pepper and add to the onions and garlic. Toss the cold turkey and ham in the hot saucepan, using a little extra butter if necessary; add to the mushrooms and onion. De-glaze the saucepan with the turkey stock. Add the cream and chopped herbs. Bring it to the boil, thicken with roux, add the meat, mushrooms and onions and simmer for 5 minutes. Taste and correct the seasoning. Fill into the pie dishes, and pipe rosettes of potato all over the top. Bake in a moderate oven, 190C/375F/regulo 5, for 15-20 minutes or until the potato is golden and the pie is bubbling. Alternatively, if you would like to have a pastry crust, allow the filling to get quite cold. Roll out the pastry to about 1/8-inch (3 mm) thickness, then cut a strip from around the edge the same width as the lip of the pie dish. Brush the edge of the dish with water and press the strip of pastry firmly down onto it; wet the top of the strip again. Cut the pastry into an oval just slightly larger than the pie dish. Press this down onto the wet border, flute the edges of the pastry with a knife and then scallop them at 1 inch (2.5 cm) approx. intervals. Roll out the trimmings and cut into leaves to decorate the top. Make a hole in the centre to allow the steam to escape while cooking. Brush with egg wash and bake in a preheated oven, 250C/475F/regulo 9, for 10 minutes; then turn the heat down to moderate, 180C/350F/regulo 4, for 20-25 minutes or until the pastry is cooked through and the pie is bubbling. A frittata is an Italian omelette. Unlike its soft and creamy French cousin, a frittata is cooked slowly over a very low heat during which time you can be whipping up a delicious salad to accompany it! It is cooked on both sides and cut into wedges like a piece of cake. This basic recipe, flavoured with grated cheese and a generous sprinkling of herbs. Like the omelette, though, you may add almost anything that takes your fancy. One could substitute grated mature cheddar but Gruyére and Parmesan give you more ‘bang for your buck’ and all sorts of tasty bits from the fridge, smoked salmon, mackerel, chorizo, bacon or ham……..
Whisk the eggs in a bowl, add the salt, freshly ground pepper, fresh herbs, diced ham and grated cheese into the eggs. Melt the butter in a non-stick frying pan. When the butter starts to foam, tip in the eggs. Turn down the heat, as low as it will go. Leave the eggs to cook gently for 12 minutes on a heat diffuser mat, or until the underneath is set. The top should still be slightly runny. Add 225g (8oz) diced cooked ham or bacon or a mixture of cold turkey and ham to the frittata and cook as above. 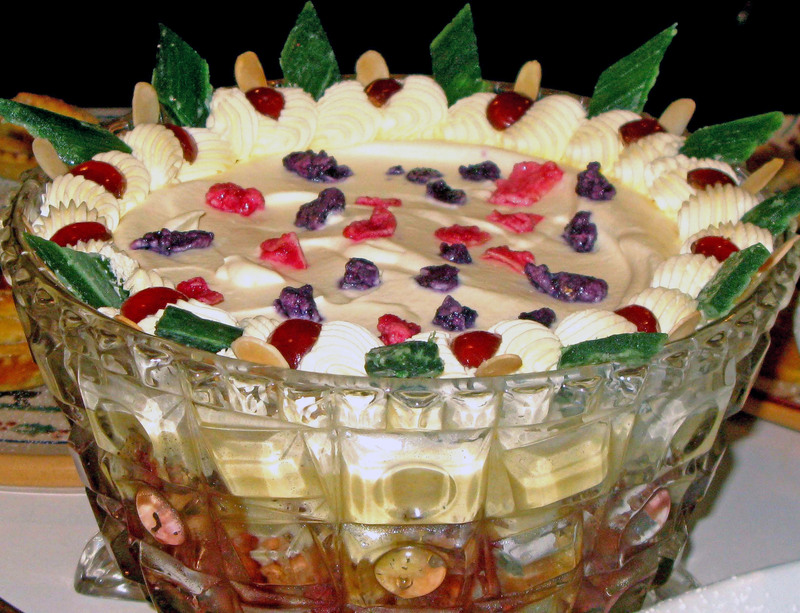 Trifle was a Christmas tradition at our house and was served in a special “cut glass” bowl kept especially for the purpose. 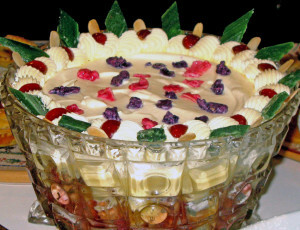 Our mother Elizabeth O’Connell’s trifle was legendary, she made huge bowls of trifle at Christmas, with trifle sponges, (later she used sponge cakes when they were unavailable), home-made raspberry jam and custard, and lots and lots of good sweet sherry. She had to become more and more inventive about hiding places, because the boys would search high and low to find it when they arrived in from a night out on the town. Eventually she hid it in her wardrobe to keep it intact for Christmas Day. This is now a favourite item on my brother Tom O’Connell’s dessert menu at O’Connell’s in Donnybrook. Cut the sponge into 2cm (3/4 inch) slices and use these to line the bottom of a 1.7 litre (3 pint) glass bowl, sprinkling generously with sherry as you go along. Pour in some homemade egg custard and then add another layer of sponge. Sprinkle with the remainder of the sherry. Spread the rest of the custard over the top. Cover and leave for 5 or 6 hours, or preferably overnight in a cold larder or fridge to mature. For a posher version, line the glass bowl with slices of swiss roll. A buttery sponge cake was standard fare to serve with afternoon tea at my Grandmother’s house in Donoghmore, Co. Kilkenny and a great many other Irish houses also. When it was taken out of the oven of the Aga it was cooled on a wire rack by the window in the back kitchen. Thick yellow cream spooned off the top of the milk in the dairy was whipped and as soon as the cake was cool it was sandwiched together with homemade jam made from the raspberries picked at the top of the haggard. This is the best sponge cake you’ll ever taste. Sandwich the two bases together with homemade raspberry jam and whipped cream. Sprinkle with sieved castor sugar. Serve on an old fashioned plate with a doyley. This is little gem of a recipe is an excellent standby, it can be made in seconds, the ingredients are inexpensive, sweet or savoury fillings work. Sift the flour into a bowl, make a well in the centre of the flour, drop in eggs. Using a small whisk or wooden spoon, stir continuously, gradually drawing in flour from the sides and, add the milk in a steady stream at the same time. When all the flour has been mixed in, whisk in the remainder of the milk and cool melted butter. Allow to stand for one hour. Grease Hot Deep Patty Tins with pure beef dripping or oil and fill half full. Bake in a hot oven 230°C/450°F/regulo 8, for 20 minutes approx. Remove from the tins. Cool, fill with hot turkey, ham and mushroom filling. Pop a sprig of flat parsley on top of each one and serve ASAP. Can you imagine I got my first Christmas card on the third of November, that has to be a record….Christmas is creeping up on us, not slowly but with great speed and even though we may long to opt out of the whole palaver or hide away until all the frenzy is over. It’s simply not an option, so once again, we’ll enter into the spirit of the season wholeheartedly. If you’re thinking of serving a fine free range turkey or goose for Christmas dinner, put in your order right away. Beautifully reared organic and free range birds are difficult to source for various reasons not least the lack of slaughtering facilities and support for artisan poultry producers – can you imagine that we don’t have one single poultry instructor in Ireland at present despite the craving for a product we can trust with a memorable flavour. Order a fine fat ham too from a free range heritage pig producer, this kind of food costs much more that the food of the same name on the supermarket counter shelf. Often twice the price but it does take much longer to rear with much more expensive GM free and organic feed. When those orders are in, you may want to make a plump juicy Christmas cake and a couple of gorgeous crumbly plum puddings. Despite the mystique neither are difficult to make. So allocate an afternoon. Buy top quality dried fruit, real crystallized cherries (those bright red ones are fake, most were never near a cherry in real life) and candied peel. We make our own which may seem to be a step too far – I’m sorry to be the bearer of bad news but a lot of the chopped candied peel is also fake, made from a gelatinous product rather than citrus peel. So here’s the recipe, you can make it slowly over several days, it’s a brilliant way to use up left over orange, lemon and lime peel and of course it makes a lovely present for foodie friends who can use it in cakes or puddings or simply dipped in chocolate as a petit four or sweetmeat. Even though a lovely moist Christmas cake is a great stand by, not everyone wants a big cake. 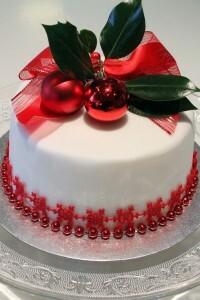 My favourite Christmas cake can be made in a 9 inch round or 2 x 7 inch tins. The second one will make a welcome present for busy friends.. We also make some ‘little dotes”, 4 inch cakes as presents for older friends who love a little cake but don’t want anything too large which lingers on after Christmas making them feel a tad guilty. Stir about Sunday is on the last Sunday before Advent, Sunday November 22nd, but even if we have missed that why not gather up some of your kids and their friends and create an exciting party atmosphere around the making of the Christmas cake and pudding. Everyone can help, lining the tin, make a wish as they stir the pudding and cake and best of all you’ll be passing on the cooking skills to another generation. For the many who feel making a Christmas cake, a pudding, mincemeat is beyond them believe me the pudding and mincemeat are simply a matter of mixing ingredients in a bowl, hardly ‘rocket science’ for even the least undomesticated goddess. Looking for a special Christmas present, don’t forget Ballymaloe Cookery School vouchers can be tailored in a variety of ways to create the perfect gift for the food lover or garden enthusiast in your life! Cooking is one of the most important skills a person can learn and the best bit is the Cookery School vouchers last indefinitely. The fruit used in this recipe should be organic if possible; otherwise scrub the peel very well. Use just one citrus fruit, or a mixture of all three. Cut the fruits in half and squeeze out the juice. Reserve the juice for another use, such as homemade lemonade. Put the halves of fruit into a large bowl (not aluminium), add the salt and cover with cold water. Leave to soak for 24 hours. Next day, discard the soaking water, put the fruit in a saucepan and cover with fresh cold water. Bring to the boil, cover and simmer very gently until the peel is soft, about 3 hours. Remove the fruit and discard the water. Scrape out any remaining flesh and membranes from inside the cut fruit, leaving the white pith and rind intact. Slice the peel into long strips or leave whole if you prefer. Dissolve the sugar in 700ml (11⁄4 pints) of water, bring to the boil, add the peel and simmer gently for about 30–60 minutes, until it looks translucent and the syrup forms a thread when the last drop falls off a metal spoon. Remove the candied peel with a slotted spoon and fill into sterilised glass jars. Pour the syrup over the peel, cover and store in a cold place or in a fridge. It should keep for 6–8 weeks, or longer under refrigeration. Spread the peel on a baking tray and leave to sit for 30–60 minutes to cool and dry out. Then toss the peel in caster sugar and store in covered glass jars until needed. Cut the candied peel into 5mm–1cm (1⁄4–1⁄2 in) slices, roll in caster sugar and serve with coffee. 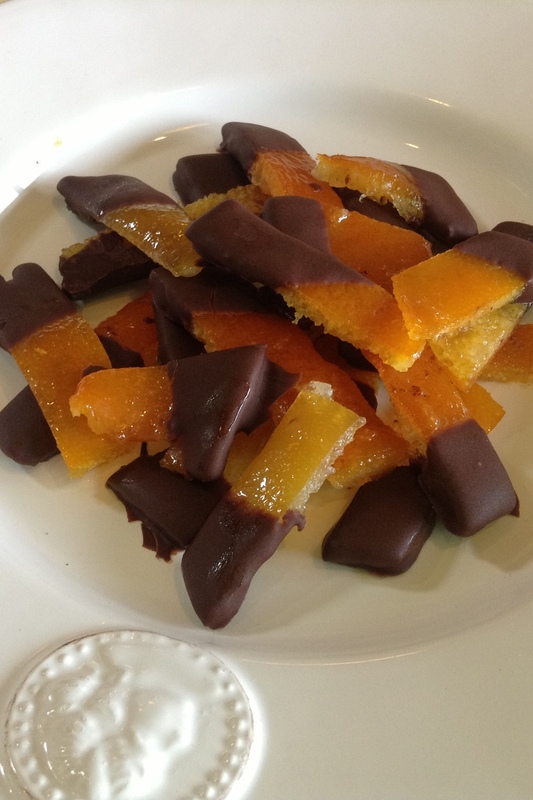 Dip the strips of candied orange peel into melted dark chocolate. Arrange individually on a sheet of silicone paper and leave to set. This is still my favourite mincemeat recipe. Suet comes from the fat that protects the beef kidney. Suet and tallow (the rendered suet) had fallen out of favour, but chips fried in suet and potatoes roasted in it are lovely. The flavour is much better and, incidentally, beef tallow has more vitamin B and despite its reputation is considerably better for you than cheap, trans-fat ridden cooking oils. People now make plum puddings with butter because they’re so paranoid of eating the wrong kinds of fat, but I’m still a great fan of the traditional plum puddings made in the classic way with suet, as they have a better flavour and texture. Serve these on hot plates, though, because if suet congeals it’s distinctly unappetising. 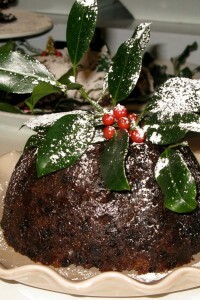 Many sweet puddings can be made with suet, such as Plum Pudding (see recipe). One can buy suet ready-prepared in packets but it’s very easy to do it yourself at home. Your butcher will probably give you the suet for free because there is so little demand. Coeliacs need to be aware that ready-prepared suet usually contains white flour. Strictly speaking, beef dripping is the fat and the meat juices that render out of a joint of roast beef while it’s cooking, whereas suet or tallow is fat just rendered from fat surrounding the beef kidney. However, nowadays the term ‘dripping’ is colloquially used to refer to all of these. Press out any air bubbles with your hands, then trim the base. Decorate as you wish. We use a little posy of winter leaves and berries including crab apples, elderberries, rosemary, old man’s beard and viburnum. That’s just one option. You could also add simple shapes stamped out of the remaining fondant icing – stars, holly leaves, Santa’s – to produce an impressive result. If you are really creative, the fondant may be coloured using edible food colouring and then you and all the family can really have fun! If you’d rather not have fondant icing, the almond paste can be toasted and will keep just as well and be irresistible to nibble. Roll out the remainder of the almond paste to about 5mm (1⁄4in) thick. Stamp out star shapes, paint the whole surface of the cake with whisked egg yolk and stick the star shapes at intervals around the sides of the cake and on top. Brush these with egg yolk also. Carefully lift the cake onto a baking tray and bake for 15–20 minutes or until just slightly toasted. Remove from the oven, leave to cool and then transfer onto a cake board. Decorate with sprigs of holly and a dusting of icing sugar, though you may feel that holly leaves and berries made of almond paste would be more appropriate for Christmas! Wash the cherries and dry them. Cut in two or four as desired. Blanch the almonds in boiling water for 1-2 minutes, rub off the skins and chop them finely. Mix the dried fruit, nuts, ground almonds and grated orange and lemon rind. Add about half the whiskey and leave for 1 hour to macerate. Divide the mixture between the 8 prepared tins. Make a slight hollow in the centre, dip your hand in water and pat it over the surface of each cake: this will ensure that the top is smooth when cooked. Put into the preheated oven, bake at 160C/325F/gas 3, for 1½ hours – until cooked; test in the centre with a skewer – it should come out clean. Pour the rest of the whiskey over the cakes and leave to cool in the tins. Next day remove from the tins. Do not remove the lining paper but wrap in some extra greaseproof paper and tin foil until required. Sieve the castor sugar and mix with the ground almonds. Beat the egg, add the whiskey and 1 tiny drop of pure almond essence, then add to the other ingredients and mix to a stiff paste. (You may not need all the egg.) Sprinkle the worktop with icing sugar, turn out the almond paste and work lightly until smooth. Remove the paper from the cakes. Put a sheet of greaseproof paper onto the worktop, dust with some icing sugar. Roll the almond paste out on the paper; it should be a little less than ½ inch (1cm) thick. Paint the top of each cake with the lightly beaten egg white and put the cake, sticky side down onto the almond paste. Make sure the almond paste sticks to the cake and then cut around the edge and tidy and smooth the almond paste. For the ‘little dotes’ we just iced the top of the cakes. Leave to dry overnight before applying Royal or Fondant Icing. With a flexible palette knife, smear the icing over the top of each cake. To achieve a snow-scene effect dab the palette knife onto the cake at irregular intervals so the icing comes up in little peaks. While the icing is still wet, stick on some Christmas Cake decorations, eg Santas, Christmas trees and robins or if you prefer use some frosted fruits or flowers.